A young man is killed and resurrected by the Aztec God of Death as his slave. The days of prophecy have come. This movie is based on the El Muerto comic by Javier Hernandez, and adapted by writer/director Brian Cox. The comic book origins are part of the title sequence. Of course, I watched it to see the incredibly beautiful Angie Cepeda (Love in the Time of Cholera, Captain Pantoja and the Special Services). I imagine others will be enchanted with Wilmer Valderrama (Fez from "That '70s Show"). 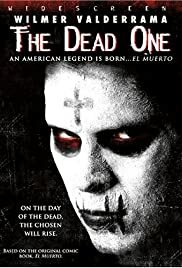 Since Diego (Valderrama) died and came back a year later, you would have to call this a zombie movie, but he is not like any zombie I have seen. He has been resurrected by Mictlantecuhtli (Nathan Mussell), the God of Death, to capture souls for sacrifice, and the soul he wants is Maria (Cepeda). Diego has to battle the gos to save himself and his girlfriend. The special effects are really good, but there is no gore in the film. All the killings occur off screen. With Michael Parks, Tony Plana, and Billy Drago, it is a good film for fans.